You rise at dawn to sneak in a morning run or gym workout, only to juggle multiple projects and hectic happenings at the office, then head home to cook diner and relax for the evening. Stay on top of your crazy schedule, daily activity levels, and exercise output with the Garmin VivoSmart residing on your wrist in slim style and flexible comfort. This 24/7 activity watch features an OLED display that fades into the watch's background when it's not in use, only coming to the forefront when you receive a smartphone update, track your daily steps, or monitor current fitness levels. 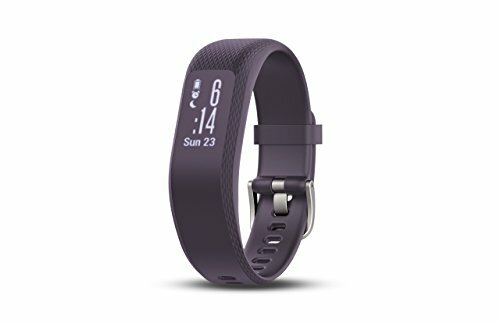 The VivoSmart features Garmin's Elevate wrist-based heart rate technology, giving you an accurate indication of your workout and run intensity, as well as providing a better glimpse into your fitness level by estimating your VO2 max and fitness age. 24/7 activity monitoring tracks steps throughout the day, overall distance on walks/runs, elapsed time on runs, floors climbed in office buildings, calories burned throughout the day, and more. Move IQ automatically detects when you're cycling, walking, running, swimming, and training indoors. Plus, you can upload all of your exercise stats to the Garmin Connect app (iOS, Android, Windows Phone) for in-depth analysis on your smartphone or tablet. Please note, the small/medium fits wrists with circumferences of 4. 8 to 7. 4 inches; the large fits wrists with circumferences of 5. 8 to 8. 5 inches.